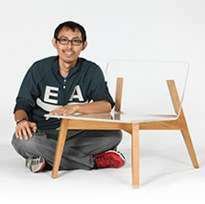 SIM Soft Chair is made of solid oak/teak wood with refined hand craftsmanship. Its most special features lie in the back of the chair. The back is specially crafted in a round shape to fit the back of human. Also, at the legs, the wood is nicely crafted into round shape to reduce the fiction withe floor.